Hello. Welcome to my large, no-charge web site DrBookspan.com. This is one page on my site of evidence-based sports medicine methods that you can use yourself, right away, to make your life better, fitter, healthier. My work is research in human physiology and performance in extreme environments, and developing evidence-based sports medicine methods that you can use yourself, right away, to fix your neck pain, back pain, knee pain, other injuries, learn smarter stretches, and make your life better, faster, smarter, and sometimes funnier. I make my web site available for a better world. This page covers preventing pain and injury when lifting loads. By using healthy lifting and carrying body positioning, you can use the lifting itself to get stronger during your ordinary daily life activities, and prevent pain, instead of being told not to lift daily loads and to go to to physical therapy to lift weights to get stronger - that's backwards and misses out on the most important things - health should come from your real life - carrying babies, backpacks, handbags, book bags, and all the daily things you need to carry and do. That is your fitness as a lifestyle. Done right, you can do more, not less, and prevent injury at the same time. These are summaries, with a wealth of knowledge still to give. See me for appointments and classes and read my books for more. Not all exercise is medicine. Not all medicine is healthy. I change that. No health insurance needed. Much of costs, time, and worry currently spent in medical treatments are unnecessary, and often unhealthful It's not health care if it's not healthy. I have developed information through years of research in the lab, and thousands of students and patients. Limited Classes and appointments to train directly with me, and workshop certification by me through my Academy for top students. More about me in Adventures. Main navigation links (Site Map) to more are at the bottom of this (and every) page, plus buttons to LIKE, SHARE, and TWEET. To make this an easy summary for you, much is shortened. Use this article to get better now, and get the books to fill in the rest. Often, articles of "do's and don'ts" to prevent back pain from lifting have rules that restrict movement, that restrict healthy fun normal life, and are often not even true. Instead, this article will show you the concept of how back pain occurs so that you can move in healthier ways that are fun, active, and let you do more than before. Healthy lifting and carrying is more than, "Lift with your knees" although few people do even that much to prevent back pain. There are often more achy backs at the end of the day from poor carrying technique than from bending wrong to pick things up in the first place. This goes for anything you lift and carry: groceries, packages, suitcases, a backpack, laundry baskets, the baby, a pet, lifting things up to shelves, lifting weights in the gym, and even carrying around the weight of your own body. 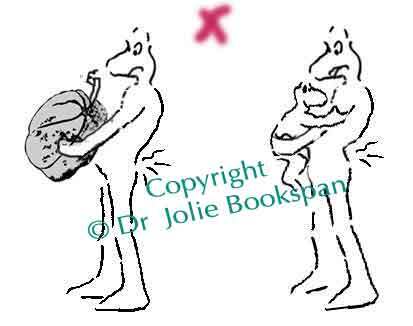 A common bad habit is to lean the upper body backward, and.or tilt your pelvis forward when carrying something in front of you, like a package, a chair, or a baby. Both are slouching posture, not a structural condition. Both increase the inward curve of the lumbar spine making swayback. Leaning backward does make lifting and carrying easier, because it shifts the load to your lower spine joints instead of using core muscles (you don't have to do work). You lose free exercise, and compress your lower back soft tissue and the low back joints called facets. This is a major cause of "mystery" lower back pain - that commonly occurs when standing and carrying. Both drawings below show swayback. Drawing on the left shows primarily leaning the upper body backward. Right shows both tilting the pelvis forward front and also leaning the upper body backward, folding the lower spine - painfully. When carrying loads in front, check if you increase the inward curve (arch) of your lower back by leaning backward (left), or lean plus tilt or push your hip forward (right). Increasing inward curve (increased lumbar sway) shifts upper body weight onto your lower spine, resulting in achy lower back pain after standing, carrying, and walking. - Stand up and pick up and hold any load in front of you, like a backpack, a baby, or a chair. Stand sideways to a mirror, if you can to better be able to see if you are doing what you think you are doing. - Notice your upper body. If you notice yourself leaning your upper body backward, straighten your body to an upright position: Pull forward enough to take the excessive arch out of your lower back. Don't curl so much forward that you round your shoulders or crane your neck. Simply straighten your body against the pull of the load. - Notice your pelvis. See if you are tilting it forward in front and out in back. Tilted pelvis is not healthy neutral position (even if many gyms and PIlates studios think so, it still causes much pain and spine compression). Bring your pelvis to vertical. 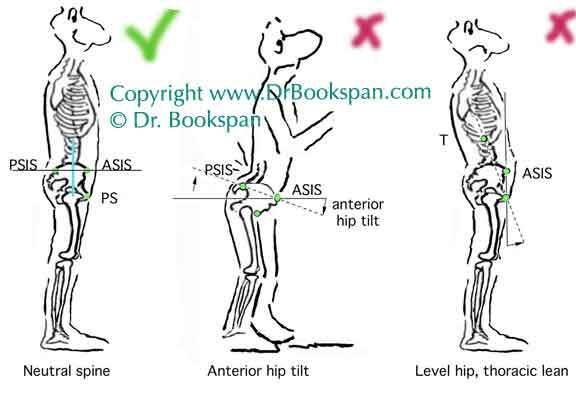 Many people who have never heard of this, or who have heard they are supposed to tilt the pelvis, and have back pain often have trouble learning this at first. It can be simple and straightforward. Stand with your back against a wall. Put your heels, backside, and upper back against the wall. Gently, easily, without any tightening of any muscles, simple move your lower back closer toward the wall. Don't touch all the way to the wall, just learn to move your pelvis a little closer. This is a pelvic tilt that you learn in order to change a painful, unhealthy tilt to a vertical pelvis. Done right, you will feel lower spine pressure go away right then. If it hurts, it's wrong. This is all explained with photos and details in the Abs Article - Fix Back Pain When Standing. - This new neutral spine is how to stand up straight against any anterior load. You will feel your abs working (but not tightening when done right. You don't want tightening because you can't breathe normally that way and muscles do not work properly when tight). Your bags, groceries, and babies could be a built-in abdominal muscle exercise. Left drawing shows neutral spine. Pelvis is vertical from top of the leg bone to the side of the hip, with no tilt. Middle and right drawings show slouching that produces swayback and an achy lower back - Middle drawing shows tilted pelvis. Right drawing shows leaning the upper body backwards. You may have heard the common, but false statement that being pregnant makes your back arch. This is not true; the pain is preventable by not leaning back to counter the weight in front. Use your abdominal muscles to fix your posture so you can stand upright without leaning backward. Of all times to prevent swayback, pregnancy it is. A surprising way to help your back is to strengthen your arms. When your arms are weak, its more tempting to rest a carried weight on your hip and lean back, letting your low back take the brunt. But even with strong arms don't lean back. It's not strengthening, but using your knowledge to position your muscles that will fix your back pain. When reaching your arms overhead to do anything from stretch, to reach a shelf, to taking a picture, to taking off your shirt, check to see if you arch your back or lean back. This shifts weight to your low back. Instead, tuck your hips under you and don't lean back, to reduce the arch of your low back. Try to reach up again holding straight position. You should feel that there is no more pressure on the lower back. You may pleasantly feel your muscles working more in your abs and shoulders. Check if you increase the inward arch of your lower back or lean backwards when reaching upward. Don't lean back. Don't let your lower back increase in arch or your hip push forward. Use neutral, pictured above. Heavy bags and backpacks don't make you arch your back, lean, or have bad posture. You do. Straighten your pelvis to neutral spine using your abdominal muscles to counter the pull, and prevent lower spine overarch. Notice if you lean back. Straighten your upper body by beginning to curl your torso, as if "doing a crunch." Don't learn forward, round your shoulders, or crane your neck. Straighten your body against the pull of the load to take the large arch out of your low back and regain healthy posture. You will feel your abs working to do this. Your bags could be a built-in abdominal muscle exercise. With posterior loads like knapsacks, its common to lean or round forward to counter the weight, or to rest the weight on your curved spine instead of holding the weight using muscular effort. Leaning forward is easier because you don't have to support the load with your muscles. But by leaning forward you shift the weight of the load onto your spine bones. That means your spine does the work instead of your muscles. You lose free exercise, promote a round-shouldered posture, and strain your back. With extremely heavy weights, for example when rescuing a heavy person or getting a truck out of a ditch you will need to lean. Whether you need to lean to unhealthful angles depends how well you prepared ahead of time. Strengthen your muscles and learn good positioning skills so you can minimize damage to your back during the few situations where the weight is too heavy. But for most carrying, prevent rounding forward, and get good exercise at the same time. Stand straight without leaning backward or forward. You will feel your muscles working. Is it natural to slouch? As natural as wetting your pants, but you learn to "hold it" even when you don't feel like it. Good body positioning is the same - learn to hold it. Use your muscles to hold your body in healthy positions when standing and carrying gear and you'll get great exercise without going to a gym, and save your back when carrying all the things, big and small, you need to carry. How Long Does It Take To Stop Lower Back Pain With Good Carrying Mechanics? Are you still leaning your upper body backward? Did you push your hips forward instead of tucking (tilting) under to straighten? DId you round your upper body forward instead of becoming straighter? Are you tightening or clenching any muscles? Tight muscles can hurt and impede healthy movement. Although it was an almost universal fad to "tighten" ab muscles, tightening does not change faulty movement, inhibits normal breathing, and can make pain of its own. Are you overcompensating? Are you making new bad movement habits that seem opposite of original unhealthy movement thinking that will "undo" or fix? Are you changing this work from exactly the way it is presented into something you have heard elsewhere? This work is different. Are you going back to bad movement habits during the day? 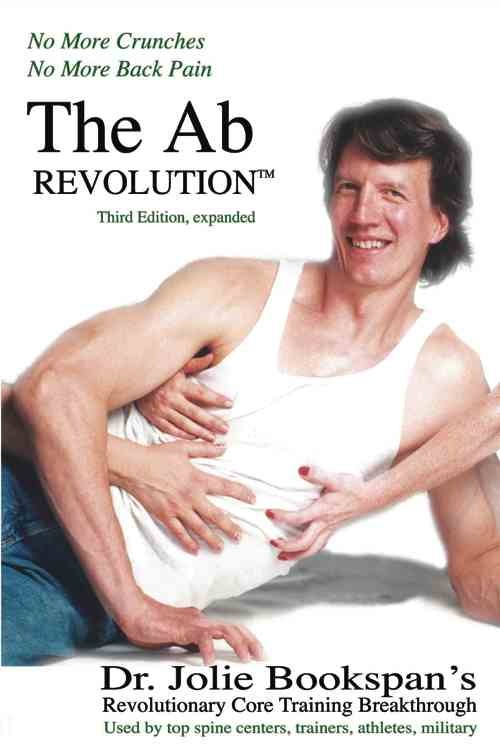 Check my free article on Bad Exercises, this one on bad stretches, and this one showing better health and understanding what abdominal muscles really do with The Ab Revolution. Is something else causing the pain, such as infection, shingles, growths, or other non-movement based situations? It is is almost always quick and easy to start getting your life back and start feeling better right now. Don't wait. If you are not sure how to tilt your hip into neutral position, use the summary Abdominal muscle article. Watch other peoples posture, gait, and movement habits when lifting and carrying. Send me photos showing the principles in action. Prizes for best candid. Send me your success stories about using these principles. Get personal written answers - Individual Care. Learn In Person. Learn top training techniques. Fix your pain. Group CLASSES and Private Appointments for yourself or your private groups. Patient Success Stories. Read how others fixed their own pain and see how to send yours. Not mere testimonials, but tutorials so you can do it too. Fix Your Pain With Fitness as a Lifestyle (Functional Fitness). Not reps of exercises or purchasing training "plans" and devices, but how you move all day, making your daily real life into your own mental, emotional and physical playground of strength mobility and health for knees and the rest of you. The Academy of Functional Exercise Medicine - Fellow Advancement, Awards, Better Earth through Dr. Bookspan's Academy. Send Your Success Stories and Photos to me on TWITTER! Prizes for the best ones. Tweet nice notes and success stories how you are better, which is my big reward. Follow me on Twitter @TheFitnessFixer for health updates, quick & short. Sharing buttons at the bottom of this page. Bookspan Basics - Quick good biomechanics retraining drills for healthier life, fitness, sports. Teachers and trainers can use these in school and team programs. - Avoid ineffective habits that work against your health - "Why Fitness Isn't Working"
Cool Gifts and Fun. 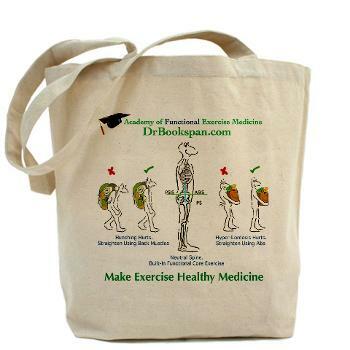 T-shirts for teachers and slouchers, mugs that remind healthy neck for drinking, Learn and promote functional health with UNcommon sense gifts from the Academy. Order the Print edition of Fix Your Own Pain from Amazon.com. Click for print edition from Amazon.com. New BLUE cover edition. The diving cult classic. Hard to find. Written by Dr. Jolie Bookspan, the Navy researcher who did the work in the field. BLUE cover is the latest edition. (Green was old) Get the new BLUE. Signed collectors edition, order directly from author through the BOOKS page. 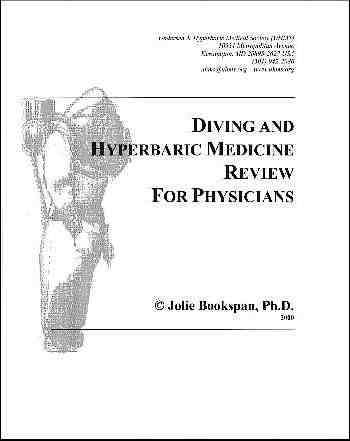 Plus other diving and hyperbaric medicine books and resources. More descriptions on the BOOKS page. Even if you don't get my books, click book links and get whatever else you want. Amazon will send this site some pennies for orders through my links, without ever sending me your name. Have fun! Information, drawings, and photos are © protected copyright. To cite this article or others on this site, or any parts, put author Dr. Bookspan, and link to this site DrBookspan.com at the top and bottom of your reprinting. A suggestion to get my books is also nice. No Derivative Works License means no changes to content, wording or links. 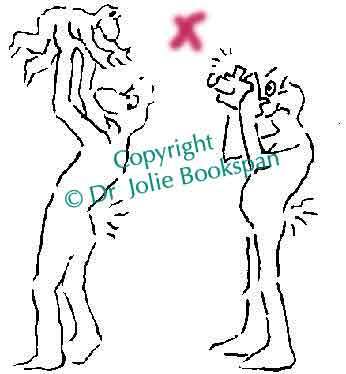 Drawings of Backman!™ copyright © by Dr. Jolie Bookspan from the book Stretching Smarter Stretching Healthier, Fix Your Own Pain, and others. More LEGAL, Waivers, and Reprint info.